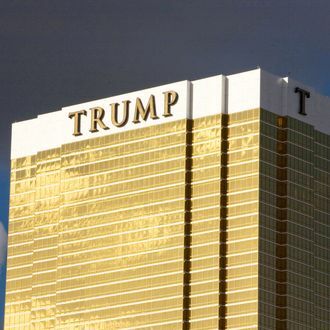 It has been argued that Donald Trump’s primary interest in running for president is less about becoming the ruler of the free world than increasing his profile and, in turn, making more money. But according to new data released by Foursquare, Trump’s presidential run could be having the exact opposite effect. Here’s a chart showing the year-over-year drop. 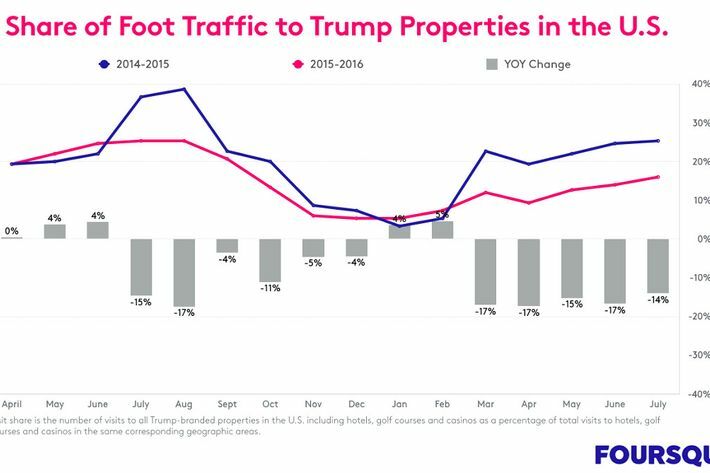 That’s raw foot traffic at all Trump-branded casinos, hotels, and golf courses. What happens when you slice the data and look at, say, properties in reliably Democratic states? It gets worse. Breaking out Blue States, the loss in foot traffic runs deeper than the national average. For the past five months, Trump’s blue state properties — spread between New York, New Jersey, Illinois, and Hawaii — have taken a real dip, with diminishing visits starting in March and a widening gap that continues straight through July, when share fell 20% versus July 2015. And what about when the data is parsed even further to look at foot traffic from women in blue states? Bet you can guess.